Kelty Redwing 44 vs 50 - which is better? Let’s cut to the chase. The Redwing 50 is by far and away the better backpack for hikers, backpackers, and outdoors-folk of all shapes and sizes. Its only downfall when compared to the Redwing 44 is that it’s too big for carry-on luggage – something that’s becoming more and more important to our readers these days, who tend to be the intrepid-frequent-flying-adventuring type. Oh yeah. Put another way, the Redwing 44 isn’t really designed for hiking and camping, and is more of a travel backpack – it’s too small for serious backpacking and is made from lightweight material that doesn’t stand up to the rigors of life on the trail. There are, however, a few other reasons why you might want to opt for the smaller backpack, and both packs have some shared features (and other major differences) which we’ll dive into below. There’s also a third option some campers might want to consider. Perhaps the biggest difference between these two backpacks is that the ​Redwing 44 has a much smaller capacity than the Redwing 50. The 44 is a near 10 liters smaller than the 50, making it a better choice for smaller trips. Simply put, if you are a larger person, are taking a longer trip, and need more storage space, the ​50 is probably the better option to go with. The pockets are much bigger, but that is not always better. The 44 is probably the better option for smaller day trips. Due to the increased size and volume of the ​Redwing 50, it is much heavier than th Redwing 44, more than a full pound heavier. Now, this might not seem like a really big deal, but the pounds do add up really quick. If both backpacks are stuffed to the limit, that single pound is something that you are going to feel. If you need something lightweight, the 44 is definitely the better option to go with, but it does have less internal volume. Simply put, the​ Redwing 44 is made for smaller people than the ​Redwing 50. If you are a smaller person, a woman, or maybe even a youth, the ​44 is probably the better option to go with. The ​​50 is meant for larger people and is probably best for larger men that are looking to go on long hikes or big trips through the city. Size does make a difference. If you are quite small and buy the ​50, or the other way around, you probably won’t be too comfortable. As can be gathered from the previous comparison sections, the ​Redwing 50 is bigger than the ​ Redwing 44. It is about 1 inch bigger in all dimensions. Now, yes, it is bigger, heavier, and intended for larger people, which is just fine. This difference really does not have anything to do with quality or usefulness. It just makes a difference in terms of your own size, comfort, and how much you need to carry around with you. The other big difference that we need to mention is that the ​Redwing 50 has a nice zipper and zipper locking mechanism. While the zipper on the ​​44 is still pretty nice, it might not be quite as durable as on the 50. There is also the fact that the Redwing 44 does not come with a zipper locking mechanism, whereas the 50 does have one. This means that the ​Redwing 50 is a little more secure than the 44 in terms of keeping your belongings from being stolen. ​Both are hydration compatible. This means that you can attach water sleeves to keep yourself hydrated on long and hot days. They both feature an aluminum and HDPE frame. This is convenient because it stops them from collapsing, plus it makes carrying easier. Both backpacks come with a dynamic airflow back panel. This is really useful for hot days where you just can’t stop sweating. These back panels provide some much needed ventilation. Both the 44 and 50 feature a U zipper design for hybrid loading. You can perform top loading or panel loading, which is nice because it really lets you pack these bags to make sure that everything you need is present. It provides easy access to your gear. Both bags are made with Poly 420D Small Back Stafford material and reinforced with Poly 75x150D Tasser Coal. In other words, both bags are extremely durable and long lasting. ​​​​Kelty Redwing 44 vs 50 - How Do They Compare? ​An increasingly popular alternative and similar size backpack to the Kelty Redwings is the Mountainsmith Approach 45​ (link to Amazon). ​The Approach 45 more or less right in the middle of the Redwing 44 and 50, and little bit cheaper too. The Mountainsmith is larger, heavier, and has more capacity than the Redwing 44, but is smaller and lighter than the Redwing 50. The manufacturer also claims it’s suitable as a carry-on. It also comes with good ventilation features, it is made of durable materials, features a dual panel loading system, and has a really nice padded hip belt. We do think that the Mountainsmith has a bit of a better hip belt in terms of comfort. And while Mountainsmith is less well-known than the likes of Kelty and Osprey, for example, the quality of the Approach 45 does in fact stand up to those brands. It’s rugged, has substantial zippers, and is made from high-quality padded mesh, making it very comfortable for long days on the trail. Its drawbacks include a lack of internal compartments separate to the main storage area, which can be frustrating when looking to tuck away a piece of expensive gear with extra protection. Furthermore, the mesh side pockets are a bit small and out of the way to be truly useful – a large water bottle will fit but not a spare shoe. It also lacks a top pocket for quick access to frequently needed items like a wallet or sunglasses. 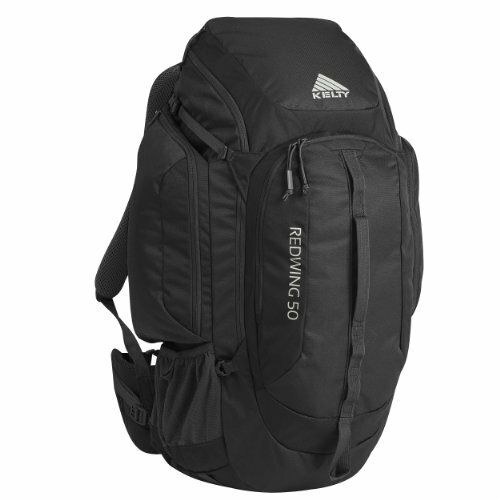 So all in all a good pack for some hikers concerned with carry-on luggage, but a few design features let it down when compared with the Redwing 50. ​Right, let’s recap why you should choose the Kelty Redwing 50 over the 44. The 50 is a more rugged, more suitable, larger, backpack for camping and hiking. The 44 is a great pack too, but its design and size means it’s much more suited as travel backpack, rather than a long-lasting and reliable bag for extensive backpacking use. We like the 44 as a carry-on backpack but that’s about it. If you definitely need a backpack in this size range, and having a carry-on is a big priority for you, then the Mountainsmith Approach 45 is a great alternative. Previous Post Osprey Stratos 34 vs 36 Next Post What Camping Gear Can I Fly With?